For other uses, see H19 (disambiguation). The Sikorsky H-19 Chickasaw (company model number S-55) was a multi-purpose helicopter used by the United States Army and United States Air Force. It was also license-built by Westland Aircraft as the Westland Whirlwind in the United Kingdom. United States Navy and United States Coast Guard models were designated HO4S, while those of the U.S. Marine Corps were designated HRS. In 1962, the U.S. Navy, U.S. Coast Guard and U.S. Marine Corps versions were all redesignated as H-19s like their U.S. Army and U.S. Air Force counterparts. Development of the H-19 was initiated privately by Sikorsky without government sponsorship. The helicopter was initially designed as a testbed for several novel design concepts intended to provide greater load-carrying ability in combination with easy maintenance. Under the leadership of designer Edward F. Katzenberger, a mockup was designed and fabricated in less than one year. The first customer was the United States Air Force, which ordered five YH-19 aircraft for evaluation; the YH-19's first flight was on 10 November 1949, less than a year after the program start date. This was followed by delivery of the first YH-19 to the U.S. Air Force on 16 April 1950 and delivery of the first HO4S-1 helicopter to the U. S. Navy on 31 August 1950. A U.S. Air Force YH-19 was sent to Korea for service trials in March 1951, where it was joined by a second YH-19 in September 1951. On 27 April 1951, the first HRS-1 was delivered to the U.S. Marine Corps, and on 2 May 1951, the first S-55 was delivered to Westland Aircraft. 1,281 of the helicopters were manufactured by Sikorsky in the United States. An additional 447 were manufactured by licensees of the helicopter including Westland Aircraft, the SNCASE in France and Mitsubishi in Japan. The helicopter was widely exported, used by many other nations, including Portugal, Greece, Israel, Chile, South Africa, Denmark and Turkey. In 1954 the Marines tested an idea to enhance lift in hot and high and/or heavily loaded conditions by installing a rocket nozzle at the tip of each rotor blade with the fuel tank located in the center above the rotor blade hub. Enough fuel was provided for seven minutes of operation. Although tests of the system were considered successful, it was never adopted operationally. Major innovations implemented on the H-19 were the forward placement of the engine below the crew compartment and in front of the main cabin, the use of offset flapping hinges located nine inches (229 mm) from the center of the rotor, and the use of hydraulic servos for the main rotor controls. These features yielded an aircraft that was far more capable in a transport role than previous Sikorsky designs. The forward engine location placed the main cabin essentially in line with the main rotor's rotational axis and close to the aircraft center of gravity, making it easier to maintain proper weight and balance under differing loading conditions. The impetus for this design choice was the recent rejection of the Sikorsky XHJS by the U.S. Navy in favor of the tandem rotor Piasecki HUP Retriever; the Navy had strongly objected to the necessity to use ballast in the cabin-forward XHJS to maintain proper weight and balance, prompting Sikorsky to seek single-rotor design alternatives that did not require this. The offset flapping hinges and hydraulic servos gave more positive flight control under differing loading conditions, isolated the flight controls from vibration, and lessened control forces; the H-19 could be flown with only two fingers on the cyclic control. The YH-19 prototypes featured a blunt aft fuselage and a single starboard-mounted horizontal tailplane with a small vertical fin at its outboard end. Initial production models added a large fillet-like fin behind the fuselage and under the tailboom, and the tailplane configuration was changed to an inverted "V" shape. Early H-19 and HO4S variants were powered by a Pratt & Whitney R-1340-57 radial rated at 600 hp (472 kW) and used a centrifugal clutch that automatically engaged the main rotor when a preset engine speed was reached. However, the HO4S was deemed underpowered in U.S. Navy service with this powerplant, so the aircraft was re-engined with a 700 hp (522 kW) Wright R-1300-3 radial which the U.S. Navy found to be adequate in an air-sea rescue role; the H-19B, HO4S-3, HRS-3, and subsequent models would use this powerplant. The R-1300 models also used a single horizontal tailplane in place of the early inverted "V" style, and a new hydro-mechanical clutch gave smoother and more rapid rotor acceleration during clutch engagement and allowed the engine to be started and operated at any speed while disengaged from the transmission and rotors. Early civilian and military S-55 models offered a folding 400 lb (181 kg) capacity hoist above the starboard main cabin door, while later models could be equipped with a more capable and reliable 600 lb (272 kg) capacity unit. Starting with the introduction of the S-55C in October 1956, the tailboom was inclined three degrees downward to provide more main rotor clearance during hard landings; models equipped with the inclined tail also used an 8 ft 9 in (2.67 m) tail rotor in place of the earlier 8 ft 8 in (2.64 m) unit. The H-19 Chickasaw holds the distinction of being the U.S. Army's first true transport helicopter and, as such, played an important role in the initial formulation of Army doctrine regarding air mobility and the battlefield employment of troop-carrying helicopters. The H-19 underwent live service tests in the hands of the 6th Transportation Company, during the Korean War beginning in 1951 as an unarmed transport helicopter. Undergoing tests such as medical evacuation, tactical control and frontline cargo support, the helicopter succeeded admirably in surpassing the capabilities of the H-5 Dragonfly which had been used throughout the war by the Army. The U.S. Marine Corps made extensive use of the H-19 in the Korean War. It was designated as the HRS in USMC service. Marine Squadron HMR-161 arrived in Korea on September 2, 1951 with 15 HRS-1 helicopters. The new helicopter squadron started operations upon arrival. On September 13, 1951, during Operation Windmill I, HMR-161 transported 18,848 pounds of gear and 74 Marines onto a ridge in the Punchbowl area. A week later HMR-161 shuttled 224 recon company marines and 17,772 pounds of supplies to a remote hilltop in the same area. Their performance continued to improve and in Operation Haylift II in February 23-27, 1953, HMR-161 lifted 1.6 million pounds of cargo to resupply two regiments. Although HMR-161 helicopters were operating in hot landing zones they did not lose any helicopters to enemy fire. HRS-1 helicopters were also used to relocate rocket launcher batteries. Because rockets create much visible dust when fired they make an easy target for enemy artillery. To reduce their exposure, launchers and crews were moved twice a day. Each HRS-1 helicopter carried four rocket launchers and extra rockets as external cargo, with the crew in the cabin. The HRS-1 helicopter proved to be durable and reliable in Korean service. One reportedly flew home after losing 18 in (46 cm) of main rotor blade to a tree. HMR-161 reported 90% aircraft availability. A Sikorsky S-55B in service with Golden West Helicopters, St. Albert, Alberta, 1985. Fairings for transmission and tail rotor driveshaft have been removed; note later-style downward-inclined tailboom. Sikorsky UH-19 at the Canadian Museum of Flight 1988.The aircraft is painted as it would have looked while working on the construction of the Mid-Canada Line. Note early-style straight tailboom. A U.S. Navy HO4S of HS-4 taking off from USS Badoeng Strait in 1954. Note inverted "V" tailplane typical of early models with R-1340 engine. The U.S. Air Force ordered 50 H-19A's for rescue duties in 1951. These aircraft were the primary rescue and medical evacuation helicopters for the USAF during the Korean War. The Air Force continued to use the H-19 through the 1960s, ultimately acquiring 270 of the H-19B model. On 1 September 1953, Sabena used the S-55 to inaugurate the first commercial helicopter service in Europe, with routes between Rotterdam and Maastricht in the Netherlands and Cologne and Bonn in Germany. France made aggressive use of helicopters in Algeria, both as troop transports and gunships, Piasecki/Vertol H-21 and Sud-built Sikorski H-34 helicopters rapidly displaced fixed-wing aircraft for the transport of paras and quick-reaction commando teams. In Indochina, a small number of Hiller H-23s and Sikorsky H-19s were available for casualty evacuation. In 1956, the French Air Force experimented with arming the H-19, then being superseded in service by the more capable Piasecki H-21 and Sikorsky H-34 helicopters. The H-19 was originally fitted with a 20-mm cannon, two rocket launchers, two 12.7-mm machine guns, and a 7.5-mm light machine gun firing from the cabin windows, but this load proved far too heavy, and even lightly armed H-19 gunships fitted with flexible machine guns for self-defense proved underpowered. The H-19 was also used by the French forces in the First Indochina War. A small number of war-worn H-19s were given the Vietnamese in 1958, when the French military departed. These saw very limited service in the early days of the Vietnam War, before being supplanted by the more capable Sikorsky H-34 Choctaw. 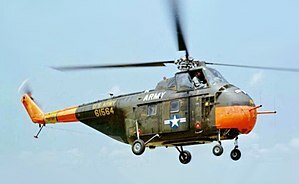 The H-19 left U.S. military service when the CH-19E was retired by U.S. Navy squadron HC-5 on 26 February 1969. Surplus H-19s were sold on the open market, and civil interest was sufficient that Sikorsky (and later Orlando Helicopter Airways) offered conversion kits allowing a military surplus H-19 to be commercially operated under a standard Federal Aviation Administration type certificate as an S-55B. [note 2] Turboshaft conversions and a novel campervan-like "Heli-Camper" conversion—featuring a built-in mini-kitchen and sleeping accommodations for four—were also offered by aftermarket modification companies. Five early production S-55s for evaluation. USAF version of the YH-19 powered by a 600 hp (472 kW) R-1340-57 engine, redesignated UH-19A in 1962, 50 built. H-19As modified for air-sea rescue, redesignated HH-19A in 1962. H-19A with a more powerful 700 hp (522 kW) R-1300-3 engine, redesignated UH-19B in 1962, 264 built. H-19Bs modified for air-sea rescue, redesignated HH-19B in 1962. US Army version of the H-19A, redesignated UH-19C in 1962, 72 built. US Army version of the H-19B, redesignated UH-19D in 1962, 301 built. US Navy version of the H-19A, ten built. Air-sea rescue version with R-1340 derated to 550 hp (410 kW), three built for Royal Canadian Navy (RCN), two surviving aircraft subsequently converted to HO4S-3 standard. United States Coast Guard version of HO4S-2, seven built. Re-engined US Navy & Canadian version with 700 hp (522 kW) Wright R-1300-3 engine, US Navy aircraft redesignated UH-19F in 1962 (RCN/CAF aircraft retained HO4S-3 designation), 79 built. United States Coast Guard version of the HO4S-3, redesignated HH-19G in 1962, 30 built. United States Marine Corps version of the HO4S for eight troops, 600 hp (472 kW) R-1340-57 engine, 60 built. HRS-1 with equipment changes, 101 built. HRS-2 with 700 hp (522 kW) R-1300-3 engine, became CH-19E in 1962, 105 built and conversions from HRS-2. Project for HRS-3 with a 1,025 hp (764 kW) R-1820 radial engine, not built. Commercial version with 600 hp (472 kW) R-1340 engine. Commercial version with 800 hp (596 kW) R-1300-3 engine. New designation given to civilian kit conversions of military surplus H-19s with R-1300-3 engine. S-55A with a 600 hp (472 kW) R-1340 engine. Aircraft modified by Aviation Specialties and produced and marketed by Helitec with a 650 shp (485 kW) Garrett AiResearch TPE-331-3U-303 turboshaft and updated equipment. Commercial conversion. Ultra-quiet helicopter for sight-seeing flights over the Grand Canyon. Commercial conversions carried out by Orlando Helicopters. Commercial conversion. Aerial advertising helicopter, fitted with a 12.2-m x (40-ft x 8-ft) array of computer-controlled lights. Commercial conversion. Flying crane helicopter. Commercial conversion. 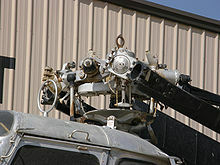 S-55 helicopters converted into flying targets. Commercial conversion. Armed military helicopter. HRS-2 for Royal Navy, ten delivered. H04S-3 for Royal Navy, 15 delivered. Later marks of Whirlwind were built under licence. Highly modified S-55 from Vertical Aircraft Technologies Inc., powered by a 522 kW (700 hp) Garret TSE311 driving a 5-bladed rotor. See Westland Whirlwind (helicopter) for examples of the British license-built S-55. H-04 – S-55 on display at the Museo Nacional de Aeronáutica de Argentina in Morón, Buenos Aires. 0371/55-633 – S-55 on display at the Museo de la Aviacion Naval in Bahia Blanca, Buenos Aires. 55885 – HO4S-3 on static display at the Shearwater Aviation Museum in Shearwater, Nova Scotia. It is painted in Royal Canadian Navy Sqn. No. 7 colors as used by Anti-Submarine Squadron HS-50 and Utility Squadron HU-21. S-884 – S-55C on static display at the Danmarks Flymuseum in Skjern, Ringkøbing-Skjern. 53-4458 – H-19B on static display at the Deutsches Museum in Munich, Bavaria. IZ1590 – S-55C on static display at the Indian Air Force Museum in Palam, Delhi. 03 – H-19 on static display at the Israeli Air Force Museum in Hatzerim, South District. JG-0001 – H-19C on static display at the Tokorozawa Aviation Museum in Tokorozawa, Saitama. 40012 – H-19C in storage at the Kawaguchiko Motor Museum in Narusawa, Yamanashi. 56-4279 – H-19 D-4 on static display at the Norwegian Armed Forces Aircraft Collection in Gardermoen, Akershus. 9101 - UH-19 at the Museu do Ar on Sintra Air Base near Lisbon. 11714 – S-55 on static display at the Museum of Aviation in Surčin, Belgrade. H3-3/97 – Type 3 on display at the Royal Thai Air Force Museum in Bangkok, Bangkok. 52-7577 – UH-19B on static display at the Istanbul Aviation Museum in Istanbul, Istanbul. Unknown ID – H-19 in storage at Fantasy of Flight in Polk City, Florida. Unknown ID – UH-19F on static display at Kirtland Air Force Base in Albuquerque, New Mexico. 130151 – CH-19E on static display at the National Museum of Naval Aviation in Pensacola, Florida. It is displayed in a US Coast Guard paint scheme. 130252 – HRS-3 on static display at the Flying Leatherneck Aviation Museum in San Diego, California. It is painted with the unit markings of HMR-161. 49-2012 – YH-19 on static display at the Udvar-Hazy Center of the National Air and Space Museum in Chantilly, Virginia. This airframe was the first S-55 built. 52-7537 – UH-19B on static display at the Pima Air and Space Museum in Tucson, Arizona. It is painted as a rescue helicopter with the 534th Air Defense Group. 52-7587 – UH-19 on static display at the National Museum of the United States Air Force in Dayton, Ohio. It is painted as Hopalong, one of the helicopters to make the first transatlantic flight. 52-7602 – H-19D on static display at the Evergreen Aviation & Space Museum in McMinnville, Oregon. It is painted in U.S. Army scheme. 53-4426 – H-19B on static display at the Strategic Air Command & Aerospace Museum in Ashland, Nebraska. 55-4943 – UH-19D on static display at the Estrella Warbird Museum in Paso Robles, California. This airframe had previously been on display at the Museum of Flight in Seattle, Washington. 57-5937 – UH-19D on static display at the Valiant Air Command Warbird Museum in Titusville, Florida. It is painted in a USAF rescue scheme. It was previously on display at the EAA AirVenture Museum in Oshkosh, Wisconsin. 59-4973 – UH-19D on static display at the Camp San Luis Obispo Museum and Historical Site in San Luis Obispo, California. None normally fitted ; H-19s used for armament tests at Fort Rucker were experimentally equipped with a variety of automatic weapons and rockets. H-19s in Southeast Asia were sometimes equipped with door-mounted .30 in (7.62 mm) or .50 in (12.70 mm) calibre machine-guns for self-defence and suppression of enemy fire near landing lones. 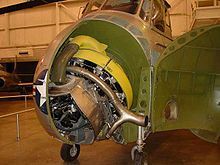 ^ The accessories for a radial engine were traditionally located on the side of the engine opposite the crankshaft; in a prop-powered airplane that used the more commonplace tractor configuration, the accessories were typically buried inside a cowling or nacelle, resulting in less convenient access than the reversed orientation used in the H-19. ^ Military aircraft typically do not receive type certificates and thus cannot lawfully be operated commercially, except in certain special cases, such as a civil transport being adopted for military service without significant modifications. ^ a b c d e f g h i j k l m n Devine, Vinny (November 2012). "S-55/H-19/HO4S/HRS Helicopter". Sikorsky Product History. Igor Sikorsky Historical Archives. Retrieved 7 July 2015. ^ "Helicopter Gets Power Boost from Rockets." Popular Mechanics, November 1954, p. 94. ^ a b c Bazzani, Mario (October 2011). "Sikorsky S-55/H-19 - History and technical description". heli-archive. Retrieved 10 July 2015. ^ "Sikorsky Archives - S-55". www.sikorskyarchives.com. Retrieved 13 January 2018. ^ "Sikorsky UH-19B Chickasaw." National Museum of the US Air Force. Retrieved: 13 September 2015. ^ a b "Sikorsky HO4S-2G / 3G; HH-19G "Chickasaw"" (PDF). U.S. Coast Guard Aviation History. Retrieved 30 June 2015. ^ a b Murray, Robert. "Canada Aviation Museum Aircraft – Sikorsky HO4S-3 (S-55) Horse – Royal Canadian Navy (RCN)" (PDF). Canada Aviation Museum. Retrieved 30 June 2015. ^ "Here Comes the Leathernecks!" Popular Mechanics, April 1952, p. 97. ^ "Sikorsky HO4S-3 "Horse"". Shearwater Aviation Museum. Retrieved 21 October 2014. ^ "Danmarks Flymuseum – Sikorsky S-55C". Flymuseum.dk. Retrieved 23 October 2012. ^ Deutsches Museum. "Deutsches Museum: Sikorsky S-55". deutsches-museum.de. Retrieved 7 September 2015. ^ "Airframe Dossier - Sikorsky S-55 / H-19 / HRS / HO4S / Whirlwind, s/n 53-4458 USAF, c/n 55-0845". Aerial Visuals. AerialVisuals.ca. Retrieved 22 October 2016. ^ "Airframe Dossier - Sikorsky S-55C, s/n IZ1590 IAF, c/n 55-1077". Aerial Visuals. AerialVisuals.ca. Retrieved 22 October 2016. ^ "Airframe Dossier - Sikorsky H-19D-4-SI Chickasaw, s/n 03 IDF, c/n 55-0992". Aerial Visuals. AerialVisuals.ca. Retrieved 22 October 2016. ^ "Experience Exhibits". Tokorozawa Aviation Museum. Tokorozawa Aviation Museum. Archived from the original on 14 March 2016. Retrieved 22 October 2016. ^ "Airframe Dossier - Sikorsky H-19C Chickasaw, s/n 40001 JASDF, c/n 55.690". Aerial Visuals. AerialVisuals.ca. Retrieved 22 October 2016. ^ Thompson, Paul. "Aviation Museums". J-Hangar Space. J-HangarSpace. Retrieved 22 October 2016. ^ Kjærnes, Erling (26 September 2011). "Sikorsky H-19 D 4 Chickasaw". Forsvaret. Retrieved 21 October 2016. ^ "Sikorsky / Westland / Soko S-55 Mk-5". Aeronautical Museum Belgrade. Aeronautical Museum-Belgrade. Retrieved 21 October 2016. ^ "Building 5:Helicopters and last propeller fighter". Royal Thai Air Force Museum. Archived from the original on 26 October 2013. Retrieved 29 October 2016. ^ "Airframe Dossier - SikorskyS-55 / H-19 / HRS / HO4S / Whirlwind, s/n H3-3/97 RTAF, c/n 55-0757". Aerial Visuals. AerialVisuals.ca. Retrieved 29 October 2016. ^ "UH-19B Chickasaw". Hava Kuvvetleri Muzesi (in Turkish). Archived from the original on 21 October 2016. Retrieved 21 October 2016. ^ "Airframe Dossier - Sikorsky UH-19B Chickasaw, s/n 52-7577 THK, c/n 55-714". Aerial Visuals. AerialVisuals.ca. Retrieved 21 October 2016. ^ "Airframe Dossier - Sikorsky H-19D Chickasaw, c/n 55-0433, c/r N111VA". Aerial Visuals. AerialVisuals.ca. Retrieved 21 October 2016. ^ "FAA REGISTRY [N111VA]". Federal Aviation Administration. U.S. Department of Transportation. Retrieved 21 October 2016. ^ "Airframe Dossier - Sikorsky UH-19F Chickasaw, s/n 138499". Aerial Visuals. AerialVisuals.ca. Retrieved 31 October 2016. ^ "HO4S". National Naval Aviation Museum. Naval Aviation Museum Foundation. Archived from the original on 13 July 2014. Retrieved 21 October 2016. ^ "Airframe Dossier - Sikorsky CH-19E Chickasaw, s/n 130151 USN, c/n 55-0208". Aerial Visuals. AerialVisuals.ca. Retrieved 21 October 2016. ^ "Aircraft Listing" (PDF). Flying Leathernecks. Flying Leatherneck Historical Foundation. Retrieved 21 October 2016. ^ "Sikorsky YH-19". Smithsonian National Air and Space Museum. Retrieved 21 October 2016. ^ "Airframe Dossier - Sikorsky YH-19A Chickasaw, s/n 49-2012 USAF, c/n 55-0001, c/r N2797". Aerial Visuals. AerialVisuals.ca. Retrieved 21 October 2016. ^ "CHICKASAW". Pima Air & Space Museum. Pimaair.org. Retrieved 21 October 2016. ^ "Sikorsky UH-19B Chickasaw". National Museum of the US Air Force. 5 May 2015. Retrieved 21 October 2016. ^ "Helicopters". Evergreen Museum Campus. Evergreen Museum. Retrieved 21 October 2016. ^ "Airframe Dossier - SikorskyS-55 / H-19 / HRS / HO4S / Whirlwind, s/n 52-7602 USAF, c/r N55233". Aerial Visuals. AerialVisuals.ca. Retrieved 21 October 2016. ^ "c/n 55-520". helis.com. Retrieved 21 October 2016. ^ "H-19B "Whirlwind"". Strategic Air Command & Aerospace Museum. Strategic Air Command & Aerospace Museum. Retrieved 21 October 2016. ^ "Sikorsky UH-19D Chickasaw". Estrella WarBirds Museum. Retrieved 21 October 2016. ^ "Static Non-Flying Collection". Valiant Air Command Warbird Museum. Valiant Air Command. Retrieved 21 October 2016. ^ "Airframe Dossier - Sikorsky UH-19D Chickasaw, s/n 57-5937 USAF, c/n 55-1221, c/r N37788". Aerial Visuals. AerialVisuals.ca. Retrieved 21 October 2016. ^ "H-19 "Chickasaw"". The California Military Museum. Retrieved 29 October 2016. ^ "Airframe Dossier - SikorskyS-55 / H-19 / HRS / HO4S / Whirlwind, s/n 59-4973 USAF, c/n 55-1277". Aerial Visuals. AerialVisuals.ca. Retrieved 29 October 2016. ^ Harding 1990, p. 231. Harding, Stephen. U.S. Army Aircraft Since 1947, Shrewsbury, UK: Airlife Publishing (1990). ISBN 1-85310-102-8. Riley, David, French Helicopter Operations in Algeria, Marine Corps Gazette, February 1958, pp. 21–26. Núñez Padin, Jorge Felix; Cicalesi, Juan Carlos (2011). Núñez Padin, Jorge Felix (ed.). Sikorsky S-55/H-19 & S-58/T. Serie en Argentina (in Spanish). 6. Bahía Blanca, Argentina: Fuerzas Aeronavales. ISBN 978-987-1682-13-3. Archived from the original on 27 August 2014. Retrieved 24 August 2014. Wikimedia Commons has media related to Sikorsky H-19.